The eroded rock of the amphitheater is more eroded than, but otherwise similar to formations at nearby Bryce Canyon National Park, Red Canyon in Dixie National Forest and select areas of Cedar Mountain (SR-14). Because of its elevation, snow often makes parts of the park inaccessible to vehicles from October through May. Its rim visitor center is open from June through October. Several hundred thousand people visit the monument annually. The monument area is the headwaters of Mammoth Creek, a tributary of the Sevier River. Wildlife can often be seen in this high altitude setting. 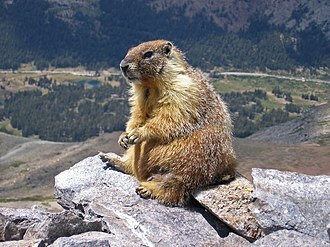 Mule deer and porcupines are common, as are rodents and similar animals such as marmots, golden-mantled ground squirrels, pocket gophers, and chipmunks. Mountain lions and other larger animals live in the area but are seldom seen. 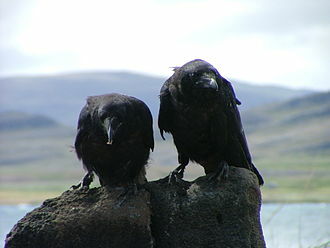 Common birds include the Clark's nutcracker, violet-green swallows, and the common raven. A Larkspur wildflower near the rim of Cedar Breaks. The bristlecone pine, a species of tree that is known as the longest living single organism, can also be found in the high country, with some local specimens known to be more than 1600 years old. Sub-alpine meadows dot the canyon rim in such areas as Alpine Pond, which is an easy hike from the road along a clear trail. Aspen, Engelmann spruce, subalpine fir trees, and limber pine also grow here. Spring begins in June at this elevation, when wildflowers cover the canyon rim. Wildflowers bloom all during the short growing season, and visitors can enjoy Colorado columbine, scarlet paintbrush, subalpine larkspur, pretty shooting star, orange sneezeweed, Panguitch buckwheat, prairie smoke, silvery lupin, yellow evening primrose, shrubby cinquefoil, Parry primrose, plantainleaf buttercup, and two species of Penstemon. The amphitheater, located near the west end of the Colorado Plateau, covers the west side of the Markagunt Plateau, the same plateau that forms parts of Zion National Park. Uplift and erosion formed the canyon over millions of years, raising and then wearing away the shale, limestone, and sandstone that was deposited at the bottom of an ancient 70 by 250 miles (110 km × 400 km) lake, known as Lake Claron about 60 million years ago.It continues to erode at a pace of about 2 inches (50 mm) every 5 years. Atop the plateau, volcanic rock known as rhyolitic tuff covers much of the area, formed during cataclysmic eruptions around 28 million years ago. The rocks of the eroded canyon contain iron and manganese in various combinations, providing brilliant colors that led Indians to call it the Circle of Painted Cliffs. Iron oxides provide the reds, oranges and yellows, while manganese oxides provide shades of purple. The color of rock is soft and subtle compared to the hoodoos at Bryce Canyon. The area is a form of badlands—canyons, spires, walls, and cliffs so steep and confusing that the lands, while of great aesthetic value, are of little utilitarian worth. Early settlers called them badlands or breaks and created its current name by combining breaks with cedar for the many juniper trees (often incorrectly called cedars) that grow in the area. Cedar Breaks National Monument was established in 1933. 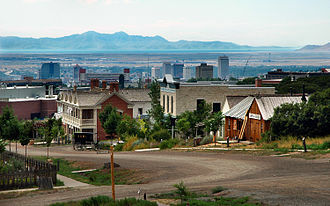 A small lodge, designed by Gilbert Stanley Underwood and built and operated by the Utah Parks Company once existed near the south end of the monument, but it was razed in 1972. The Cedar Breaks Lodge was the smallest of the park lodges in the Southwest. It was deemed "uneconomical to operate" by the Park Service, but protests associated with its demolition caused the Park Service to re-examine its policies concerning lodges in other parks, contributing to their preservation. There are two well advertised hiking trails in the monument, and a campsite near the canyon rim. In 2006, Iron County officials considered a proposal for legislation to expand the monument and rename it Cedar Breaks National Park. The new park would include the adjacent Ashdown Gorge Wilderness, some private land and nearby Flanigan Arch. View from the canyon rim. Cedar Breaks looking northeast from the canyon rim. The canyon-rim visitor center at 10,350 feet (3,150 m) is open 5 months of the year. Panorama of Cedar Breaks National Monument. Panoramic view of Cedar Breaks National Monument to the north during sunset. ^ "Listing of acreage as of December 31, 2011". 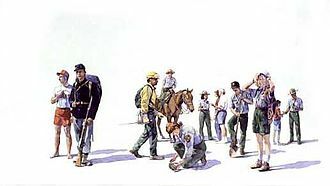 Land Resource Division, National Park Service. Retrieved 2012-12-30. ^ "NPS Annual Recreation Visits Report". National Park Service. Retrieved 2017-09-27. ^ "Frequently Asked Questions". 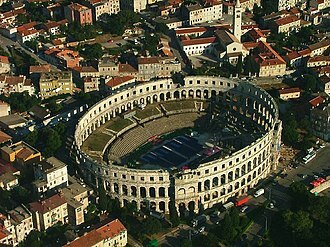 SevierRiver.org. Retrieved 2010-10-26. ^ "Cedar Breaks National Monument - Animals". National Park Service. Retrieved 2018-05-02. ^ "Cedar Breaks National Monument - Trees and Shrubs". National Park Service. Retrieved 2018-05-02. ^ "Cedar Breaks National Monument - Wildflowers". National Park Service. Retrieved 2012-12-30. ^ "Cedar Breaks National Monument - Geologic Formations". National Park Service. Retrieved 2018-05-02. ^ "Cedar Breaks Historic Lodge". National Park Service. Retrieved 2018-05-02. Wikimedia Commons has media related to Cedar Breaks National Monument. Wikivoyage has a travel guide for Cedar Breaks National Monument. Shale is a fine-grained, clastic sedimentary rock composed of mud that is a mix of flakes of clay minerals and tiny fragments of other minerals, especially quartz and calcite. The ratio of clay to other minerals is variable, shale is characterized by breaks along thin laminae or parallel layering or bedding less than one centimeter in thickness, called fissility. Mudstones, on the hand, are similar in composition. Before the mid 19th century, the slate, shale. In the context of underground mining, shale was frequently referred to as slate well into the 20th century. Non-fissile rocks of similar composition but made of smaller than 0.06 mm are described as mudstones or claystone. Rocks with similar sizes but with less clay and therefore grittier are siltstones. Shale is the most common sedimentary rock, shales are typically composed of variable amounts of clay minerals and quartz grains and the typical color is gray. Addition of variable amounts of minor constituents alters the color of the rock, black shale results from the presence of greater than one percent carbonaceous material and indicates a reducing environment. Black shale can be referred to as black metal, red and green colors are indicative of ferric oxide, iron hydroxide, or micaceous minerals. Clays are the constituent of shales and other mudrocks. The clay minerals represented are largely kaolinite and illite, clay minerals of Late Tertiary mudstones are expandable smectites whereas in older rocks especially in mid- to early Paleozoic shales illites predominate. The transformation of smectite to illite produces silica, calcium, magnesium and these released elements form authigenic quartz, calcite, ankerite and albite, all trace to minor minerals found in shales and other mudrocks. Shales and mudrocks contain roughly 95 percent of the matter in all sedimentary rocks. However, this amounts to less than one percent by mass in an average shale, black shales, which form in anoxic conditions, contain reduced free carbon along with ferrous iron and sulfur. 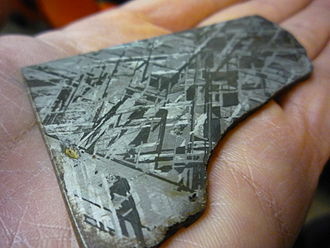 Pyrite and amorphous iron sulfide along with carbon produce the black coloration, the process in the rock cycle which forms shale is called compaction. 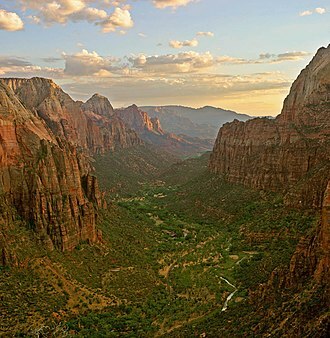 Zion National Park is located in the Southwestern United States, near Springdale, Utah. The lowest elevation is 3,666 ft at Coalpits Wash, located at the junction of the Colorado Plateau, Great Basin, and Mojave Desert regions, the parks unique geography and variety of life zones allow for unusual plant and animal diversity. Numerous plant species as well as 289 species of birds,75 mammals, and 32 reptiles inhabit the parks four life zones, riparian and coniferous forest. Zion National Park includes mountains, buttes, monoliths, slot canyons, human habitation of the area started about 8,000 years ago with small family groups of Native Americans, the semi-nomadic Basketmaker Anasazi stem from one of these groups. In turn, the Virgin Anasazi culture developed as the Basketmakers settled in permanent communities, a different group, the Parowan Fremont, lived in the area as well. 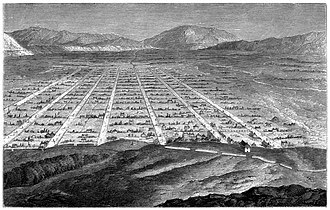 Both groups moved away by 1300 and were replaced by the Parrusits, Mormons came into the area in 1858 and settled there in the early 1860s. In 1909 the President of the United States, William Howard Taft, named the area a National Monument to protect the canyon, under the name of Mukuntuweap National Monument. 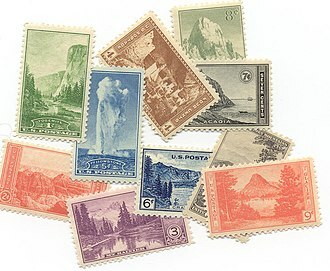 In 1918, the director of the newly created National Park Service changed the parks name to Zion. According to historian Hal Rothman, The name change played to a prevalent bias of the time, many believed that Spanish and Indian names would deter visitors who, if they could not pronounce the name of a place, might not bother to visit it. 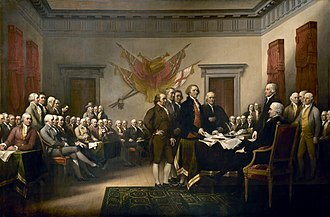 The new name, had greater appeal to an ethnocentric audience, the United States Congress established the monument as a National Park on November 19,1919. The Kolob section was proclaimed a separate Zion National Monument in 1937, the geology of the Zion and Kolob canyons area includes nine formations that together represent 150 million years of mostly Mesozoic-aged sedimentation. At various periods in that warm, shallow seas, streams and lakes, vast deserts. Uplift associated with the creation of the Colorado Plateaus lifted the region 10,000 feet starting 13 million years ago, the park is located in southwestern Utah in Washington and Kane counties. Orange is the colour of carrots and apricots. It is between red and yellow in the spectrum of light, and on the traditional painters colour wheel and it is named after the fruit of the same name. In Asia it is an important symbolic colour of Buddhism and Hinduism, the colour orange is named after the appearance of the ripe orange fruit. The word comes from the Old French orange, from the old term for the fruit, the French word, in turn, comes from the Italian arancia, based on Arabic nāranj, derived from the Sanskrit naranga. The first recorded use of orange as a name in English was in 1512. Prior to this word being introduced to the English-speaking world, saffron already existed in the English language, crog referred to the saffron colour, so that orange was referred to as ġeolurēad for reddish orange, or ġeolucrog for yellowish orange. Alternatively, orange things were sometimes described as red such as red deer, red hair, in ancient Egypt artists used an orange mineral pigment called realgar for tomb paintings, as well as other uses. It was used by Medieval artists for the colouring of manuscripts, pigments were made in ancient times from a mineral known as orpiment. Orpiment was an important item of trade in the Roman Empire and was used as a medicine in China although it contains arsenic and is highly toxic and it was used as a fly poison and to poison arrows. Because of its colour, it was a favourite with alchemists searching for a way to make gold. Before the late 15th century, the colour orange existed in Europe, portuguese merchants brought the first orange trees to Europe from Asia in the late 15th and early 16th century, along with the Sanskrit naranga, which gradually became orange in English. The House of Orange-Nassau was one of the most influential houses in Europe in the 16th and 17th centuries. 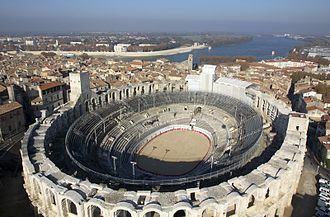 It originated in 1163 the tiny Principality of Orange, a state of 108 square miles north of Avignon in southern France. The family of the Prince of Orange eventually adopted the name, the colour came to be associated with Protestantism, due to participation by the House of Orange on the Protestant side in the French Wars of Religion. Dixie National Forest is a United States National Forest in Utah with headquarters in Cedar City. It occupies almost two acres and stretches for about 170 miles across southern Utah. 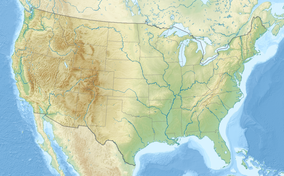 The largest national forest in Utah, it straddles the divide between the Great Basin and the Colorado River, in descending order of forestland area it is located in parts of Garfield, Iron, Kane and Piute counties. The majority of forest acreage lies in Garfield County, there are local ranger district offices in Cedar City, Panguitch, St. George, and Teasdale. Elevations vary from 2,800 feet above sea level near St. George, the southern rim of the Great Basin, near the Colorado River, provides spectacular scenery. Colorado River canyons are made up of multi-colored cliffs and steep-walled gorges, the Forest is divided into four geographic areas. High altitude forests in gently rolling hills characterize the Markagunt, Boulder Mountain, one of the largest high-elevation plateaus in the United States, is dotted with hundreds of small lakes 10,000 to 11,000 feet above sea level. The forest includes the Pine Valley Mountains north of St. George The Forest has many climatic extremes, precipitation ranges from 10 inches in the lower elevations to more than 40 inches per year near Brian Head Peak 11,307 feet. At the higher elevations, most of the precipitation falls as snow. Thunderstorms are common during July and August and produce heavy rains, in some areas, August is the wettest month of the year. Temperature extremes can be impressive, with temperatures exceeding 100 degrees Fahrenheit near St. George. The vegetation of the Forest grades from sparse, desert-type plants at the elevations to stand of low-growing pinyon pine. At the higher elevations and conifers such as pine, the Dixie Forest Reserve was established on September 25,1905 by the General Land Office. 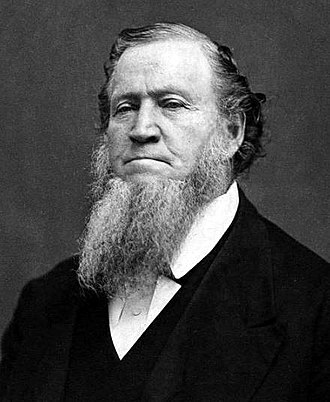 The name was derived from the description of the warm southern part of Utah as Dixie. In 1906 the U. S. Forest Service assumed responsibility for the lands, the western part of Sevier National Forest was added on July 1,1922, and all of Powell National Forest on October 1,1944. 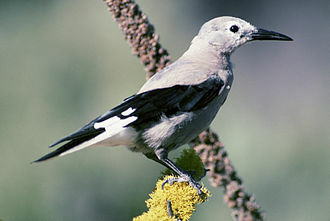 Clarks nutcracker, sometimes referred to as Clarks crow or woodpecker crow, is a passerine bird in the family Corvidae. It is slightly smaller than its Eurasian relative the spotted nutcracker and it is ashy-grey all over except for the black-and-white wings and central tail feathers. The bill and feet are black and this bird derives its name from the explorer William Clark. It can be seen in western North America from British Columbia and western Alberta in the north to Baja California, there is a small isolated population on the peak of Cerro Potosí, elevation 3,700 metres, in Nuevo León, northeast Mexico. It is mainly found in mountains at altitudes of 900–3,900 metres in conifer forest, outside the breeding season, it may wander extensively to lower altitudes and further east as far as Illinois, particularly following any cone crop failure in its normal areas. During migrations to lower altitudes, it uses the seeds of pinyon pines. The isolated Cerro Potosí population is associated with the local endemic Potosi pinyon Pinus culminicola. All Clarks Nutcrackers have a sublingual pouch capable of holding around 50–150 seeds, depending on the size of the seeds, Clarks nutcrackers store seeds, usually in the ground for consumption, in caches of 1–15 seeds. Depending on the crop as well as the tree species. 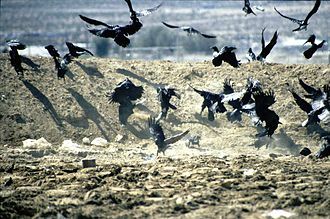 Through this activity of caching and over-storing, the bird is perpetuating its own habitat, the diet includes a wide range of insect prey and other fruits, small mammals and occasionally flesh from carcasses. Eggs and nestlings are sometimes devoured, and peanuts and suet have become a favorite at bird tables, food is taken both from the ground and from trees, where the nutcrackers are very agile among the branches. 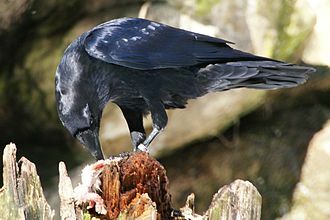 The birds are able to extract food by clasping pine cones in such a way that the cones are held one or both feet. 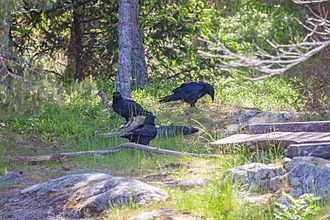 The birds hack the cones open with their strong bills, rotten logs are hacked into in order to locate large beetle grubs, and animal dung may be flipped over in search of insects. Clarks nutcrackers can be opportunistic feeders in developed areas, and are known to some as camp robbers, the species usually nests in pines or other types of conifers during early spring. Chipmunks are small, striped rodents of the family Sciuridae. Chipmunks are found in North America, with the exception of the Siberian chipmunk which is primarily in Asia. These classifications are arbitrary, and most taxonomies over the century have placed the chipmunks in a single genus. 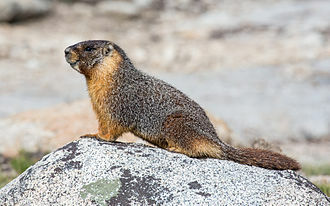 However, studies of mitochondrial DNA show that the divergence between each of the three groups is comparable to the genetic dissimilarity between Marmota and Spermophilus. The genus name Tamias is Greek for treasurer, steward, or housekeeper, the common name originally may have been spelled chitmunk, from the native Odawa word jidmoonh, meaning red squirrel. The earliest form cited in the Oxford English Dictionary is chipmonk, other early forms include chipmuck and chipminck, and in the 1830s they were referred to as chip squirrels, probably in reference to the sound they make. In the mid-1800s, John James Audubon and his sons included a lithograph of the chipmunk in their Viviparous Quadrupeds of North America, Chipmunks have been referred to as striped squirrels, munks, timber tigers, and ground squirrels. Chipmunks have a diet primarily consisting of seeds and other fruits. They commonly eat grass and many forms of plant matter, as well as fungi and other arthropods, small frogs, worms. 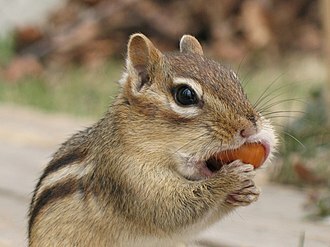 Around humans, chipmunks can eat cultivated grains and vegetables, and other plants from farms and gardens, Chipmunks mostly forage on the ground, but they climb trees to obtain nuts such as hazelnuts and acorns. At the beginning of autumn, many species of chipmunk begin to stockpile nonperishable foods for winter and they mostly cache their foods in a larder in their burrows and remain in their nests until spring, unlike some other species which make many small caches of food. Cheek pouches allow chipmunks to carry items to their burrows for either storage or consumption. Eastern chipmunks mate in spring and again in early summer. Western chipmunks breed only once a year, the young emerge from the burrow after about six weeks and strike out on their own within the next two weeks. These small mammals fulfill several important functions in forest ecosystems and their activities harvesting and hoarding tree seeds play a crucial role in seedling establishment. A hoodoo is a tall, thin spire of rock that protrudes from the bottom of an arid drainage basin or badland. Hoodoos, which may range from 1.5 to 45 metres, typically consist of soft rock topped by harder. They generally form within sedimentary rock and volcanic rock formations, Hoodoos are found mainly in the desert in dry, hot areas. In common usage, the difference between hoodoos and pinnacles is that hoodoos have a variable thickness often described as having a totem pole-shaped body, a spire, on the other hand, has a smoother profile or uniform thickness that tapers from the ground upward. An example of a spire, as an earth pyramid, is found at Aultderg Burn, near Fochabers. Hoodoos range in size from the height of a human to heights exceeding a 10-story building. Hoodoo shapes are affected by the patterns of alternating hard. Minerals deposited within different rock types cause hoodoos to have different colors throughout their height, Hoodoos are commonly found in the High Plateaus region of the Colorado Plateau and in the Badlands regions of the Northern Great Plains. While hoodoos are scattered throughout these areas, nowhere in the world are they as abundant as in the section of Bryce Canyon National Park. They are very prominent a few hundred miles away at Goblin Valley State Park on the side of the San Rafael Swell. Hoodoos are a tourist attraction in the Cappadocia region of Turkey and these rock formations were depicted on the reverse of the Turkish 50 new lira banknote of 2005–2009. Đavolja Varoš hoodoos in Serbia feature 202 exotic formations described as earth pyramids or towers, since 1959, Đavolja Varoš has been protected by the state. It was a nominee in the New Seven Wonders of Nature campaign, the hoodoo stones on the northern coast of Taiwan are unusual for their coastal setting. The stones formed as the seabed rose rapidly out of the ocean during the Miocene epoch, efforts have been made to slow the erosion in the case of iconic specimens in Wanli. Hoodoos in Drumheller, are a feature that continues to attract thousands of visitors each year. Aspen is a common name for certain tree species, but not all, are classified by botanists in the section Populus, of the Populus genus. They are all medium-sized deciduous trees reaching 15–30 m tall, each individual tree can live for 40–150 years above ground, but the root system of the colony is long-lived. In some cases, this is for thousands of years, sending up new trunks as the older trunks die off above ground, for this reason, it is considered to be an indicator of ancient woodlands. One such colony in Utah, given the nickname of Pando, is estimated to be 80,000 years old, some aspen colonies become very large with time, spreading about 1 m per year, eventually covering many hectares. They are able to survive forest fires, because the roots are below the heat of the fire, aspens do not thrive in the shade, and it is difficult for seedlings to grow in an already mature aspen stand. Fire indirectly benefits aspen trees, since it allows the saplings to flourish in open sunlight in the burned landscape, young aspen bark is an important seasonal forage for the European hare and other animals in early spring. 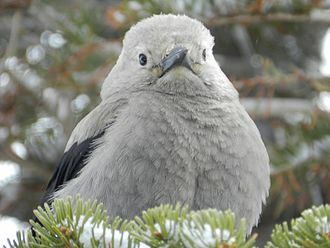 A Clark's Nutcracker nestled on a branch at Crater Lake National Park in Oregon. Flowers of most species have five spreading sepals and four petals (e.g. Delphinium nuttallianum). cv. 'Crimson Star' in visible light, UV (showing nectar guides), and IR.